I'm feeling a bit earthy these days. 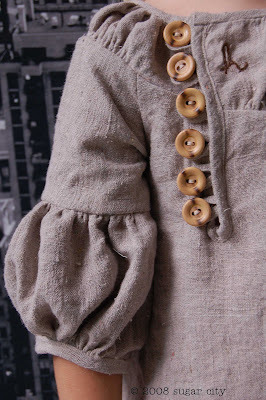 A nubby linen, wooden buttons and some undulations in the neckline and sleeves; all transport me into another realm. This place is quiet--except for the chirping of the frogs-- and green, with gently nodding ferns and tall oaks. There is no plastic, no concrete, no Walmart television screaming in my ear. I think we shall go for a walk in the woods and gather something. Maybe some berries or acorns. To make sure my girl doesn't lose her way, I've conveniently embroidered her initial on the front of her dress. Any of the villagers will know who she is and direct her towards home. Alas, I can hear the baby shreiking from fear of the older brother who is wielding a large stick. I'd better run. This pattern will be in the shop soon--all ready for your genius creation. Maybe it will be something earthy, maybe a bit more city-like. Whatever it is, I'm sure your girl will love it! Oh, I can't wait to buy this pattern. I love it! What a beautiful dress. It just looks so cute on your daughter. Oh, love this. What about a pattern to fit us big girls? Actually, I'd love to wear most of the things you make for the little girls! melissa!!! are you kidding?! this dress is so perfect. you have to figure out adult sizes on this!! I love it, love it! Beautiful, cool, and feminine! Gorgeous! Looking forward to the patterns, you crafty creative wonders! It's so wonderful! 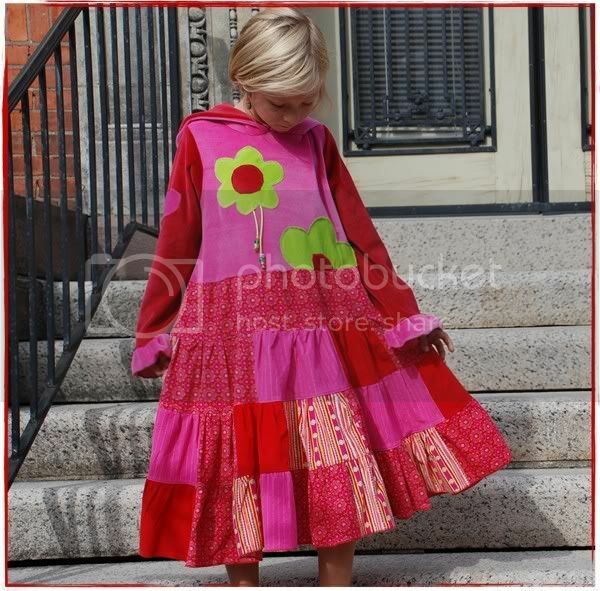 You don't see many amazing patterns like this dress around for little ones. I will definitely be getting this pattern. Good Lord, how great is this dress?? I'm awestruck. Details are flawless, and the fabric hits JUST the right note. So wonderful! i am madly in love! i love the simple embelishments that make it extrordinary and unique, and the fact that it can be city or country like. this is beautiful! (I've been lurking around your blog for a while, but how could I not comment on this dress?) Glad to here the pattern will be in your shop. Lovely. It really suits your daughter too. love love love it. Natural and so beautiful. Well done! This is truly incredible. I like your earthy look very much. I really really really really love this dress. I really really really really hope you sell the pattern in a suitable size for me to make my daughter a dress. She's a girl's size 8 - 10. Absolutely love it! I want the pattern in my size! 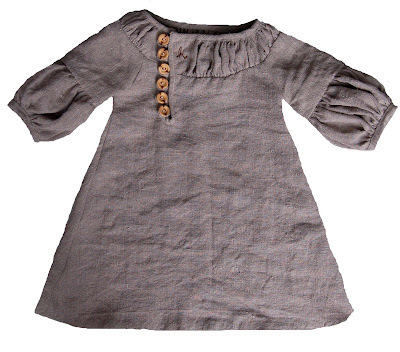 I LOVE the nubby grey linen and wood buttons. this is my favorite of all the dresses so far. I am so excited that you have drawn up patterns for your dresses! I can't wait to work with them and make this fantastic dress. Soon, soon, soon please! I can't wait to make this for my daughter. I'm in the nubbly country version but I can see making more than one for the city girl in us! I'm absolutely smitten with that dress. I want one! Waouh ! How beautiful !!!! I love this GORGEOUS dress ! I'm so excited. I've been waiting for this news sine you first said you were setting up shop. I so want to make one of these for a little auction we are having for fundraising for my daughter's pre-school. I'm going to make it in a silk/linen blend. Extravagant, I know, but very, very special. Yes, please! -t would be great for curvy gal sizes, too. Brilliant!! ooooo. I cant wait to get my hands on that pattern. it is so wonderful!! This is inspirational - I can't wait to put my girls in boots again this fall!! Love it! This pattern will be a must! Once again, amazed by your talent! I love this!! I can't wait to get my hands on that pattern! I can't wait for this pattern either. You all do such beautiful work. Wow! This is so stunning I too had to de-lurk. Everything detail about it is lovely! oh my! amazing dress - can't wait to see the pattern! I am one of the people who is very much looking forward to the dress patterns. I have to admit my favorite dress is still the servant dress, but this one is very beautiful too. You simply can't find classic clothes like this at the mall for kids. How wonderful that you guys are making these for your girls, and now for wanting to share your secrets with all of us. I can't wait! This is the one I have been waiting for! I love the earthy look! And the wood buttons were the perfect choice. Nice contrast. I especially love the personal touch of the embroidery. Believe it or not, I think this would look so great in the city. A fabulous contrast to the urban setting! i bet you could make the cutest little red riding hood dress. for some reason, this little frock made me think of it, combined with your wanting to go take a walk in the woods. if you were to make such a little red dress, what fabric would you use? also, i love the name of your blog. i am going without sugar all year so your title was very catchy to me! Oh, I'm speechless. The dress is absolutely gorgeous. I love the dress in this fabric. Very chic. I'm going to add my plea to the others, these dresses would be great as adult patterns! LOVE IT! I have 2 girls and I look at your blog everyday for inspiration. I am sewing for them but I would like to make more dresses like yours. I can't wait for the pattern. I would buy all the patterns that you would offer! A pattern you say! How delightful! I can hardly wait! I noticed that little "h" right away... this is the perfect dress as we head towards fall! And with these unseasonally cool temps lately, it's perfect for right now! I wish I could be as inspired as you are! Guys - I am looking for a perfect back to school outfit for my girls and little pea coats for the fall but not finding much. Are you going to be putting anything like that up in your shop? Oh, I love this dress so much. Cannot wait to see your patterns. Just amazing. This is a really gorgeous dress!! Wow. Absolutely gorgeous dress here. Can I ask where did you get the print that she is behind her?? Absolutely exquisite. I cannot wait for the pattern. How do I get to your shop to buy the pattern? I'm new to your blog and didn't see a connection. I LOVE the dress! This is such a CUTE little dress for girls..EVEN i want one! 57 comments! 58th comment also says "I love it!" WOW- I am totally in love with this!! Gorgeous! Je viens de voir de très jolies choses ! Où peut-on trouver ces patrons ? j'aimerais beaucoup réaliser cette robe!!!! thanks for the advices and the new pictures, ey can you tell me if I can find this dress in some shop in the town? I want to buy one for my child.